Circular letter of Naval Technical Committee #15 dated November 29, 1910 says: Neither instruction can list all the duties of an officer or consider all cases and issue amendments. Thus Mssrs Engineers shall display initiative and being guided by their profession performing all efforts in order to justify their appointment. Well-known scientist and shipbuilder Alexey Krylov once said: Quite often the true cause of an accident was neither unavoidable nor cogent forces of nature or “inevitable accidents at sea” but poor understanding of basic performance characteristics of a ship, failures to observe precautionary measures, lack of cautiousness and other similar unfavorable qualities of the crew. Perhaps, this statement is still relevant nowadays. Electric generating plant of a ship is often referred to as heart of a ship. Smooth-running operation of engines and mechanisms directly influences operating of other departments. During round Europe cruise of training ship Perekop the great burden fell upon the shoulders of those who were in charge of engines operation i.e. personnel of department five and especially its commanding officer of electromechanic department captain of the 2nd rank Andrei Tsvetkov. His Navy service began as ordinary seaman in Sevastopol in the training squadron named after Admiral Oktyabrski. He continued the service later as a warrant officer at guided missile boat Kaliningradski komsomolets. After promotion to lieutenant position in the early nineties he served in Guinea assisting local seamen to master our equipment. In May of 1995 he was transferred to Perekop as senior lieutenant and still remains faithful to this ship. By the way one of Tsvetkov’s hobbies is modeling of miniature ships. He got interested in it yet before his naval life. There are new Tsvetkov’s models displayed in the great cabin of the ship that serves as a mess and evening tea parlor for cruise commanders. It is interesting that Tsvetkov’s son at this time Navy officer who serves at Kamchatka used to be in training at Perekop. 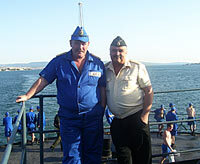 Captain of the 2nd rank Oleg Goncharov also participated in the round Europe cruise. He was born in Leningrad oblast. Yet as a cadet he took part in a cruise on board of Perekop to East German port of Rostok. In 1984 he graduated from V.I. Lenin’s Naval Academy. Nowadays this institution is called Naval Institute of Engineers. His first appointment was department five commander on coastal-type mine sweeper BT-126 assigned to naval base in Kronstadt. In a year he was transferred as department commander to sea-going type mine sweeper MT-485 and in three years after that he was promoted to position of chief mechanical engineer of harbor-type mine sweepers division. Being in this position he entered N.G. Kuznetsov’s Naval Academy in 1994. Namely Oleg Ottovich was the last commanding officer of electromechanic department of training ship Khasan not less legendary than Perekop that prowled the seas and oceans in all directions to say so. From Khasan he was appointed to position of electromechanic service head of the 4th division at that moment consisted of about 40 units of different types. In 2001 the division was reduced and Goncharov became deputy commander of the 105th waterway area defense brigade. He occupied this post until recently. Not long before Perekop left Kronstadt and headed for Novorossisk he was transferred to the position of chief mechanical engineer of training motor boats division. The division consists of 7 crafts with 6 of them operational. All boats built in Poland and are over thirty years old each. Nevertheless they perform regular trips in the Gulf of Finland with future officers on board. Not less than 30 cadets from naval educational institution of St. Petersburg take part in every cruise. Goncharov also participates in the cruises of training ships. For example in 2003 he visited Kiel in Germany as a part Smolniy’s crew and in 2006 he was in Belgium at Perekop. Until recently Goncharov was a member of state grading commission in Naval Institute of Engineers at the faculty of diesel power plants considering graduation works of future officers. These men the ace mechanical engineers are responsible for running of ship’s heart. And this means one can be sure in ship’s “health”.